Let’s say that I’m the director of technology & innovation, and regularly work with our technology leadership group, which includes managers and other leads from within our department. Using Google Drive alone, I can create a folder within Google Drive and share it with the team, allowing for document sharing and collaboration. I am ultimately, though, the owner of that folder and of the files that I create. If I or a member of my group leaves, their files go with them. With Google Team Drive, the contents of the drive belong to the group, not to an individual. If the membership of a committee changes, an employee leaves the district, or any other group membership change occurs, the files remain as they are, accessible to the whole group. How do I get started with Team Drive? It’s easy! 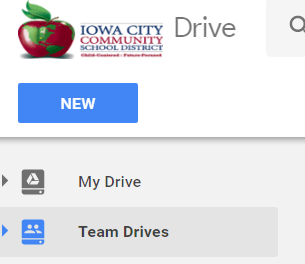 Since we enabled team drives, you should now notice a Team Drive option on the left side of your Google Drive interface (available at http://drive.google.com). In order to create a team drive, select the “Team Drives” item (highlighted in blue in the image), then click the “New” button in the top left corner. Enter a name for your Team Drive, and click “Create”. After you’ve created your Team Drive, you will be taken to the Team Drive page, and can click the “Add Members” button to add members to the team. When adding members, you have the option to give full access (create/edit/delete), edit access (edit/create), comments-only access (no editing, just commenting), and view-only access (can view but cannot edit or comment). You will also be prompted to enter a message that will be sent via email to all members, or to opt for no notification to be sent. Once your drive is created, you can create new docs, upload files, and move documents from your Google Drive just as you do within your own Google Drive.